Trivedi notes in the afterword that, a mere month after his project was completed, a flood sealed the fate of the cabinet, which was moved to the university’s surplus department, most likely to be discarded. This book, then, is the sole record, however oblique, of a catalog of knowledge. 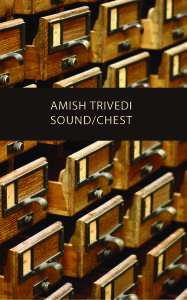 Kate Schapira and Rae Armantrout, in their blurbs for Sound/Chest, make use of the fact of the flood as a means to describe Trivedi’s work. These are poems of small brinks, short falls, shorings up; they seek sustenance rather than certainty. To sound is to hear how deep something goes, to wait for an echo of touch to tell you, this is where the water stops. We don’t call what’s under the water “land,” but we might call it knowledge; we might call it persistence; we might call it patience. At the bottom of Sound/Chest, the next thing we turn over might be the thing we need. In these poems, Amish Trivedi gives us the “surreal” as the new normal, all the mind’s dated catalogue awash in the rising waters of the present. In the barely off-stage catastrophe sending ripples through this book, what we cling to is as strange as what we seek to avoid. These poems would work, and do, without the extra bit of knowledge regarding the flood, and yet Schapira and Armantrout seem to treat Trivedi’s afterword / afterthought as crucial to the poems themselves, rather than letting the poems speak for themselves. Are they trying to insert a conceptualism where there is only coincidence? There/was some talk/of electrical outlets and role playing”: An amazing surrealist montage as failed stand-up joke or an occult dating show about Abu Ghraib? From the farcical to the sublime: these poems keep babbling until they’ve told us just about everything we did and did not want to know about ourselves. Trivedi’s process is a jumping-off point for some truly inspired post-Flarf poetry that lays bare the soul and psyche of a persona who, schizophrenically is drowning and taking measurements to fathom the meaning of the depths. All three blurbs serve to triangulate Trivedi’s poetic location. Dan Coffey hails from Buffalo, NY and has made the Midwest his second home. The librarian for English and World Literature at Iowa State University, Dan lives in Ames, Iowa, with his wife and son. He has had poems published or forthcoming in Poetry Bay, Kennesaw Review, MiPoesias, Dirt, and The Laurel Review.